Law enforcement officials, who have been at the forefront of demands to include a “kill switch” in all smartphones, hailed the news as proof that the technology is working as a deterrent. 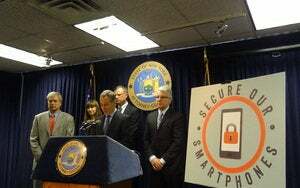 “The huge drops in smartphone theft that have occurred since the kill switch has been on the market are evidence that our strategy is making people safer in our cities, and across the world,” said New York State Attorney General Eric Schneiderman in a statement. The kill switch is a software lock that can be remotely activated when a phone is lost or stolen. It can wipe personal data from a phone and “brick it” so it can’t be reused or reprogrammed. Soon most smartphones sold will include a kill switch thanks to a new California law that mandates them in smartphones manufactured after July 1 this year and sold in the state. While the law only covers California, it’s leading to their introduction in phones sold worldwide. The cellular industry at first resisted the efforts but later reversed its opposition. Major U.S. carriers are also being more proactive about sharing data on stolen phones so they cannot be activated on networks in the U.S. and abroad even if they don’t contain a kill switch.